A little Slovenian town of Lendava, placed at the Hungarian border, is again the scene of Lendava Bowl this Saturday. A tradition coming into its third year, this season’s Lendava Bowl pairs up two familiar teams with very different goals. Ljubljana Silverhawks still hold a chance of defending the CEFL Bowl, boosted by a few other favorable scores after a positive outcome in this game. 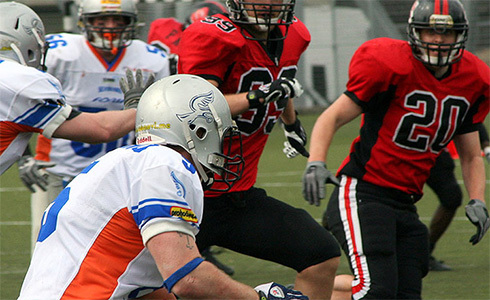 Conversely, their Lendava Bowl rival, the Budapest Wolves, have only pride to play for. The standings table math sees the Silverhawks returning to the CEFL Bowl for a second year in a row with a win over the Budapest Wolves and a triumph over the Kragujevac Wild Boars with more than 2 touchdown difference in final week’s game. Before having that opportunity, they put their hopes on the Belgrade Vukovi winning over the Wild Boars this Sunday. On the other hand, with no wins this season so far, the Budapest Wolves can jump in front of their Lendava Bowl rival in case of winning. More importantly, doing so, they ruin Silverhawks’ CEFL Bowl dreams and shoot the Wild Boars into the big one before the final week of play. The Lendava Bowl score is tied at 1-1, with the Wolves winning in 2011 and the Silverhawks returning the favor with a blowout the following year. The Silverhawks have already won a tough game in Hungary this season and they expect to do so again at their “home away from home” versus the Wolves. Expecting a large number of their own supporters cheering them on, the Wolves are basing their chances in this matchup on a young and inexperienced Slovenian team. This Lendava Bowl can prove to be the best one yet. After all, third time’s the charm.